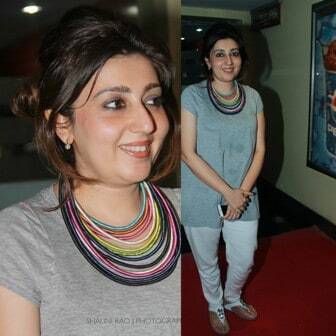 It was Cocktail hour at PVR cinema Juhu yesterday; was styled by the presence of Archana Kochhar in her usual charming self. As we all know, Archana Kochhar is a renowned couturier Designer, she has been showcasing her collections on Indian as well as International runways. Her Collection Elaborate flamboyant yet subtle, Traditional yet modern style always. During a special screening of ‘Chalo Driver’ we spotted Archana, who was there to watch a very casual screening of Saif and Deepika starrer ‘Cocktail’ (Thus, we say the Cocktail hour 🙂 ). She took time out for us and gave our shutterbugs few shots. Although casually dressed in a Jeans and T- shirt her orange lips, messy bun, the statement neckpiece and off course the Charismatic smile left us smitten. In hope of spotting more of Archana Kochhar’s style at Lakme Fashion Week Winter/Festive 2012 and beyond, I bid adieu. Also, keep watching the space for an exclusive interview with Archana Kochhar regarding her collection this season.